Seychelles is the cover story in the glossy Global Destination Magazine of India for their January and February issue of 2016 and it was the island’s Minister Alain St.Ange, the Minister responsible for Tourism and Culture who makes it on the front cover of the magazine. Entitled Mesmerising Seychelles, Global Destinations Magazine says that Nature has been too ‘kind to Seychelles which is blessed with some beautiful beaches, rarest species of flora & fauna, a bird island and the unique Garden of Eden” says Chandragupta Amritkar after his second visit to this wonderful country. “When I first visited Seychelles on an invitation from Juergen Thomas Steinmetz, Chairman ICTP and His Excellency, Alain St. Ange, Minister of Tourism and Culture, Republic of the Seychelles, I was thrilled. Having transversed across the globe, Seychelles had remained an elusive country and mostly unheard to the Indian community then. It was a wonderful experience. Three years later I again got an opportunity and I found it still is a paradise for nature lovers. This time I ﬂew Air Seychelles which has made travel to Seychelles very convenient for us Indians with direct ﬂights. The airline has 4 weekly ﬂights from Mumbai to Mahe Island and the best part is that the ﬂights leave from Mumbai early morning and from Mahe in the night thus giving the tourist full day to enjoy – both on arrival and departure days” Mr Amritkar says. 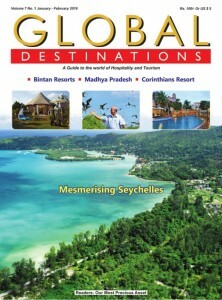 In the review in the latest Global Destinations magazine of India Mr Chandragupta Amritkar writes:- “One of the main reasons for the success of Seychelles as a tourist destination goes to His Excellency, Alain St. Ange, Minister of Tourism and Culture who has been promoting his country at numerous global events since 2009, when he was appointed as the Director of Marketing for Seychelles. Within a year he was promoted to the position of C. E.O of the Seychelles Tourism Board and seeing his success and passion in 2012 he became the Seychelles Minister for Tourism & Culture. The same year he was elected the ﬁrst President of the Indian Ocean Vanilla Islands Regional Organisation — that comprises of the islands of La Reunion, Madagascar, Mauritius, Comoros, Mayotte, Maldives and Seychelles. He was elected to the Board of the UNWTO Executive Council in 2013. To get an insight on the success story and his plans Chandragupta Amritkar spoke with His Excellency, Alain St. Ange. Excerpts of the interview:- Your Excellency, having known you for so many years what astonishes me even today is how you manage to make your presence felt at all major events across the globe. Where does such energy come from? You are too kind; I am just trying at all times to deliver for the tourism and culture industry of my country. This is my duty and one I enjoy doing. I work to deliver on my mandate as a Minister of the Government of Seychelles. To do it well, it has to be done with passion at all times, and I can say it myself that I manage the Ministry of Tourism and Culture that I head with a lot of total passion. It is this passion that stimulates me to recognize those who are working alongside me, or those who have worked before me to get Seychelles where it is today. This recognition is always sensitive because it concentrates on the man and women from the private sector and not on past politicians. This is all part and parcel of my passion for my country and, my country must include those who made my country what it is today. Seychelles is surrounded by quite a few well known tourist destinations like Mauritius. How do you compete with these countries and bring in more awareness about Seychelles globally? We are not in competition with the likes of Mauritius. Actually we complement each other. We are all in the same region and our duty and responsibility as islands of this region is to work together to grow our tourism cake. This will ensure that we all beneﬁt in return from the growth when our region becomes known and respected as the new tourism region of the world. On the question of awareness we all work differently. Seychelles is known as being press friendly and this I use a lot because Seychelles has nothing to hide, and Seychelles always prides itself that it has no NO GO areas for visiting press. What you see in Seychelles is what we are. So the rule of thumb is set our press free and let them become our Ambassadors, because after a visit to Seychelles every press member will be over impressed by what Seychelles has to offer, and for the world to hear it straight form the horses mouth, from a member of the press themselves is the best visibility we can ever hope for. You created a dedicated park at the Seychelles Tourism Academy with a view to honour pioneers of the Seychelles tourism industry. How did the idea germinate? This is a project very dear to members of the tourism industry. They have spoken about this for a long time. It is important to realize that tourism is the pillar of the Seychelles economy and tourism entrepreneurs and professionals are the main catalysts for our islands good economic results. But doing something is always a challenge whereas critics are easily made. A glass half full of water will be seen by many a glass that is half empty, whereas I see the same glass as being half full. But for me at the Ministry of Tourism and Culture and for Sherin Naiken at the Tourism Board we are convinced that through the concept of recognition we are doing justice to the industry that is our bread and butter. The beauty of the tourism pioneer park is we can always add on names of those who should be recognized. This is why I appealed to people of Seychelles to send in names of those pioneers whom we may have missed out. This is an opportunity for everyone to be positive for a cause. This year’s Grand Seychelles Tourism Ball was well attended. What were the key takeaways? World Tourism Day is celebrated every year in Seychelles with a Tourism Ball. This is when public and private sector meet and socialize instead of always meeting in the ofﬁce. This year we saw yet again committed tourism trade members come out in great numbers, but as important was the long list of the business community who are partners of the tourism industry make the effort to be seen and counted as being friends of the tourism industry. This social evening is one of the most important one of our calendar of events and we know our friends by looking at the list of those who come out to be seen and counted. What infrastructure segments do you think currently need upgrading to enhance the tourism sector’s potential? The Seychelles Brand of Tourism is the country as a whole. For too long many believed that the Seychelles Brand of Tourism was the hotel and this was so far from the truth. Our airport, our arrival formalities, out welcome, our taxis and car hires, our roads, our parks and gardens, our capital city, our inter island links etc are all as important as our white sandy beaches and warm turquoise blue seas. We need everyone to be aware of this as well as the drive by our tourism industry for our culture to be recognizes as the key unique selling point for Seychelles. When we talk about our culture we are of course placing our people at the centre of our development. What about sustainability? What steps do you plan to take to reduce impact on nature due to increased tourism? In Seychelles what you see today will be seen tomorrow, in ten years and even longer. We are set to be good custodians of what we have been blessed with. This is a Government undertaking to its people. Managing the growth of our tourism industry as we preserve what we have is navigating a ﬁne line which is why we have today imposed a moratorium on the construction of large hotels. This is to give us time to complete a detailed carrying capacity for our islands as the Ministry responsible for lands and planning looks at the islands land use plan. We have launched our very own Sustainable Label for our tourism establishments to encourage hotels owners who believe in a long term involvement in the tourism industry of Seychelles to embrace sustainable practices. Seychelles it must be noted has been at the forefront of such an inspiration even before the buzz word of eco-tourism and sustainable development became in vogue. We did it from day one of our tourism industry because we believed in it. But sustainable tourism is more than just our environment it is also our people and their involvement in the development of our industry and also our culture that must be seen and respected. How do you plan to help local communities through tourism? Seychelles Tourism is for Seychelles and for its people ﬁrst and foremost. This is why we said publicly Seychelles should claim back its tourism industry. Tourism cannot be just for big businesses, it must be all inclusive in nature where the local communities and our people see themselves as active partners. We joined the East3Route program with South Africa KwaZulu Natal, the Kingdom of Swaziland and Mozambique because this body has as its aim grass route tourism. Now we moved further through cultural tourism development with an inter district competition for Cultural Awards. This is to get our regional communities involved in showcasing culture and their own points of interests to our visitors. This is also a sure way to get tourists out of their hotels and taste Seychelles and its authentic culture. How do you plan to attract investors into Seychelles tourism sector? Seychelles offer to the business world one guarantee few other countries can offer. This is safety and a place to work that is as close to paradise as possible. Seychelles is disease free, it requires NO VISA for anyone, it has an impeccable safety label, it has a weather pattern that has given it the name of the land of perpetual summer and Seychelles is at the cross roads between East and West and the hub for South—South cooperation. We just need to spell all these points to the world at large and the business community will continue to look at Seychelles as the country for a solid investment. Above all in Seychelles your investment is respected and you will always be able to repatriate your proﬁt when and as you decide. Coming to India speciﬁc, its great news that Air Seychelles has reduced the airfare between Mumbai and Seychelles. How do you see this impacting tourism? We listened to the Indian Tour Operators and Travel Agents and this was a request they made to us. Today we can see a wave of renewed interest for the islands ever since the airfare between Seychelles and Mumbai has been reduced. India is price sensitive and we remain guided by our partners in the trade in India. Seychelles with its four hours ﬂying time from India is the ideal new tourism destination for Indian Holidaymakers. This we know will work and we are excited by this opportunity to see two countries of the Indian Ocean get even closer that they are in people to people contact through tourism. Apart from leisure travel what is the potential for Indian Honeymooners and Seychelles as a wedding destination? Destinations for honeymoons are chosen because they are different and are known to offer an experience that will be as close to paradise for the newly weds. Seychelles has been top of that list of destinations for years and we continue to pride ourselves that we are the best of the best in that special holiday break. Pristine environment, clean and secure is what Seychelles is and what it offers. If Seychelles is good for Prince William and Kate Middleton of the UK for their honeymoon, it must be good for our chosen bride as our life partner. This is why many many celebrities choose Seychelles for their honeymoon and where discretion and privacy will always be assured. I missed attending the Seychelles-India Day Celebrations as I had already scheduled visits to Taiwan and Bintan Resorts during that time. But how did the event go and any signiﬁcant achievements? Celebrating our historical links gave Seychelles a Seychelles-India Day Celebrations because India is one of the ﬁve branches that make us, the Seychellois Creole people – the special people we are today. This year’s event was a total success and attended by Dr Mahesh Sharrna, the Indian Minister of State for Tourism, Culture and Civil Aviation. We also received A. R. Rahman, the music icon of India and he was here to receive his accreditation as the Cultural Ambassador of Seychelles in India. This event has managed to solidify the unity between our Seychellois with Indian origin and this is seen as a positive step forward in creating long term stability and togetherness in Seychelles. What are some of the misperceptions of Seychelles that you’re trying to change in the Indian mindset? Seychelles suffers for the perception that it is only a tourism destination for the people’s of the world — only for the rich and famous. Yes the islands welcome many many of these stars, celebrities, Royalties, Presidents and Prime Ministers but Seychelles also welcomes the person looking for a holiday of the lifetime. The average holiday maker who travels at the back of a plane in economy is as welcomed to Seychelles as are the famous personalities. Both groups are welcomed with open arms and both groups can enjoy the Seychelles magic. What awards and accolades has the country won in last couple of years? Seychelles continues to win accolades and awards. These often reﬂect our natural beauty such as Best Beaches, but we often also win Best Resort, Best Spa or Best One-Island-One-Hotel Resort. This year for the 2015 World Travel Awards, Seychelles pulled the Award for the Indian Ocean Leading Destination and also the Indian Ocean Leading Cruise Destination. It was also the Seychelles Tourism Board that won the Best Tourism Board for 2015. What is the present tourism scenario? Seychelles is proud of its achievements in the ﬁeld of tourism. Today we are cruising with a 20% increase in visitor arrival numbers over 2014. A hotel group in Seychelles such as Hilton Hotels with three hotels has conﬁrmed that 2015 has been their best year ever in hotel occupancy and in yield. These figures are clear demonstrations that we are working as a tourism destination and that our public—private sector partnership in place is paying dividend. Our private sector trade remain our key partners and we value their commitment to the industry. What new initiatives have you planned for 2016 and say next five years? Seychelles needs to consolidate its achievements. This is very important for our islands because we depend on tourism, the industry that has become the pillar of our economy. The path to consolidation will also relook at our service delivery, value for money of a Seychelles holiday as well as how we are seen by visitors. We shall be embarking on a revisited Tourism Master Plan to ensure it is reﬂecting the Seychelles of today. This will mean a self assessment of what we are and also of what we do.